Join Charlie Brown and the rest of the delightful "Peanuts" gang in their smashing debut on the silver screen in the late Charles M. Schulz's first full-length animated motion picture. It's a movie filled with all the characters and charm that has made "Peanuts" the most popular comic strip in the world. And it is musical entertainment that will positively make you grin from ear to ear. Our story begins with Charlie Brown gearing up for his first pitch of the baseball season - stopping midstream because his pitcher's mound is filled with dandelions. It's one enchanting scene after another in this very special movie that brings all our "Peanuts" characters to fun-loving life. With excitement added by Vince Gauraldi's jazz music and songs by Rod McKuen, A Boy Named Charlie Brown is a motion picture Gene Shalit said is "so cheerful I can hardly wait for the next one!" Peanuts came to life as a comic strip in 1950. The series leapt to the TV screen with 1965’s A Charlie Brown Christmas and made it to the musical stage in 1967’s You’re a Good Man, Charlie Brown. From there all that remained was the movie screen, and the Peanuts crew jumped there with 1969’s A Boy Named Charlie Brown. The film concentrates on the consistent pain and suffering of Charlie Brown (voiced by Peter Robbins). He fails at everything he does. He can’t fly a kite, he can’t win a baseball game, and even his therapist Lucy (Pamelyn Ferdin) does little more than delineate all his flaws. Against his better judgment, Charlie Brown enters a spelling bee at school. To the shock of all – including himself – he wins the class contest and then emerges as the school champion. This means he gains an entry in the national bee. The movie follows his adventures there along with pals Linus (Glenn Gilger) and Snoopy (Bill Melendez). If I wanted to pick on negatives attached to Boy, I could find a few. The primary concern is that there isn’t much about it that makes it feel like a feature film. Instead, it comes across as a really long TV special – just without the Dolley Madison commercials. The animation seems little improved over the early television shows, and the story certainly doesn’t warrant feature-length exposition. This whole thing probably could have run much shorter and been just as satisfying. The film pads its length with quite a few superfluous musical numbers. I’m sure others will disagree and find those pieces to work better than I do, but I just think they drag the story too much. The plot is flimsy enough as it is; the addition of a long Beethoven tune or Snoopy’s fantasy hockey game don’t make it move any more swiftly. They strike me as elements included for little reason other than to make sure the movie reaches feature length. I will admit they’re some of the few moments that don’t feel swiped straight from the comic strips. That factor is a double-edged sword. On one hand, I think the story lacks a lot of ambition, and many of the gags come across as ones recycled from the strip. However, at least we get a good connection to Peanuts and the piece never seems detached from its origins. Now that I’ve offered criticisms of Boy, I can take off my reviewer hat and tell you that most of its cinematic problems are really irrelevant. There’s too much pleasure and joy to be taken from Boy for its flaws to matter much. The film acts as a very fun extension of the comics and satisfies in most ways. The cast sure get things right. Robbins originated the lead voice back in 1965, and he brings just the right tones of sadness, angst and frustration to Charlie Brown. Ferdin’s Lucy remains the perfect fussbudget as she shows a wonderfully pushy, bossy sensibility. Gilger’s Linus is a little lackluster, but overall this is a good cast. I’m not wild about the title tune, but the rest of the music works well. I particularly like the downbeat, off-kilter cast given to Vince Guaraldi’s famous Peanuts theme when Linus loses his blanket. The score goes away from the usual peppiness to convey the character’s state of mind and does so wonderfully. Is the animation cheap and TV-quality? Sure. Is the story perfunctory at best? Definitely. Does the movie entertain and delight? Without question. 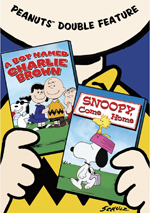 A Boy Named Charlie Brown appears in an aspect ratio of approximately 1.85:1 on this single-sided, single-layered DVD; the image has been enhanced for 16X9 televisions. While not terrible, the transfer suffered from a variety of flaws. Most of the concerns resulted from print defects. Few parts of the movie passed unaffected, as the movie showed quite a few specks, marks, grit, blotches, lines and scratches. I thought it became a bit cleaner as it progressed, but the result remained awfully messy. Sharpness was up and down as well. Most of the movie offered decent definition and precision, but more than a few exceptions occurred. Wider images particularly came across as a bit soft. Jagged edges and shimmering weren’t apparent, but some light haloes could be seen. As with everything else, colors varied. At times they looked reasonably bright and lively, but other shots were drab and dingy. There wasn’t much consistency to the tones. Blacks were acceptably dark and dense, but shadows tended to seem too thick. The smattering of low light shots were slightly tough to discern. This left us with a “C-“ transfer. One oddity about the transfer: I don’t know if the 1.85:1 ratio represents the movie’s original dimensions. The closing credits came windowboxed and looked to be 1.66:1. I didn’t think the film obviously appeared cropped on top and bottom, though the framing did occasionally seem a bit tight. However, if the movie wasn’t intended to be seen 1.66:1, why would it go to those dimensions for the credits? On the other hand, the Dolby Digital 5.1 soundtrack of A Boy Named Charlie Brown worked pretty well. The soundfield opened up to a surprising degree, as the mix seemed consistently broad. Localized speech occasionally came from the sides, and effects were placed accurately. Movement was perfectly decent as well. Stereo imaging for the music was unexceptional, though. The score and songs spread to the sides without much real definition. I wouldn’t call it “broad mono” but I didn’t detect any particular clarity to the placement of the instruments. The surrounds acted to reinforce music and effects to a minor degree and that was it. Audio quality remained decent. Speech could be slightly flat, but the lines were consistently intelligible and lacked any edginess. Music also sometimes suffered from lackluster high-end, as the tunes and score seemed a little muted. Nonetheless, they were acceptable concise, and bass response was surprisingly good. Effects sounded more than acceptable, as they showed good clarity and passable depth. This was a pretty nice little soundtrack for an older film. That means we still lack extras. Not even a trailer makes an appearance on this barebones release. As one who grew up with Peanuts TV specials and movies, I may not be the most objective judge of A Boy Named Charlie Brown. The fact I still adore the comic strips and remember the other pieces fondly makes me biased, but I think even when I try to view things objectively, Boy works. It’s charming and entertaining. The DVD is nothing special, though. It offers surprisingly good audio but provides flawed picture and no extras. The combination of a likable movie and a low list price makes this one a disc I recommend, but not without some qualms due to the lackluster quality of this release. 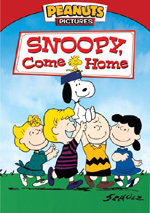 Note that this release of A Boy Named Charlie Brown comes as part of a double-feature with 1972’s Snoopy Come Home. With a list price of $16.98, this is a great deal, especially since the movies originally retailed for $14.98 each.